Are you looking for fun-filled corporate events in Melbourne? You’ve come to the right place, because at Race Party we have exactly the thing to get the whole office talking and laughing together. If you’re stuck for your corporate event ideas in Melbourne then consider the fun and excitement of slot car racing at a venue where you can – if you so desire – also still stick to your work agenda for the day in the state-of-the-art conference rooms. How you would like to organise your corporate activities in Melbourne will determine the type of package that you will need. We have the choice between half day and full day events, and with all our packages you will get a dedicated member of staff to provide high quality service and guarantee that everything runs smoothly. You don’t have to worry about the fine details of your corporate events in Melbourne as our staff members can help directly plan the order of the days activities. You will also have the choice of two conference rooms to use when you’re not racing. Our corporate activities in Melbourne strike a great balance between being competitive on the one hand, and being friendly and informal on the other. 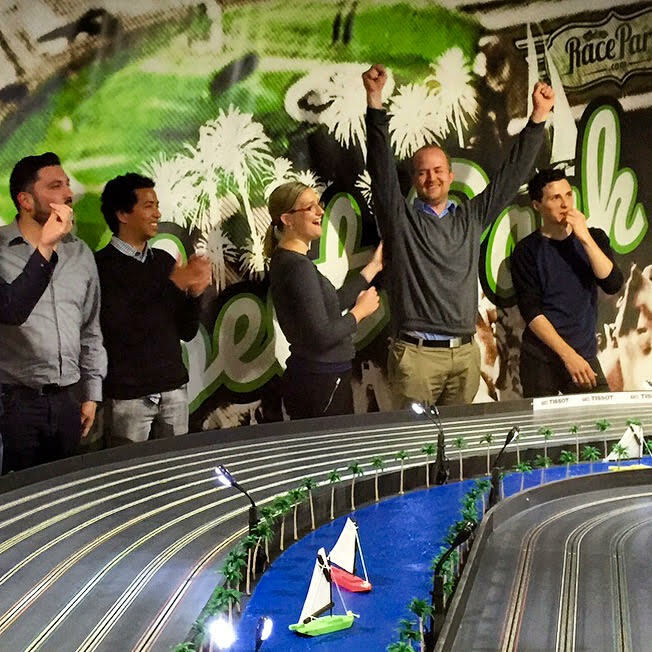 Your team will get a full sixty minutes worth of race time, ending in a finale between two employees competing to become the slot car racing champion. Even once you’re out of the race yourself, you can still have fun egging on your teammates and entering into the friendly competitive spirit. And you won’t just be thrown in at the deep-end: as part of the package you will get practice laps and qualifying laps before the competition begins. So everyone in your team – not just the naturals – will be able to experience the enjoyment of slot car racing. What's a Coporate Event without Food and Drink? One major headache when arranging corporate events in Melbourne is how to provide food and drinks for all your staff. When you book either of our packages you can receive a wide selection of varying food choices for your event. And if the standard package isn’t exactly what you had in mind then we also offer different upgrade choices, such as the Asian selection platter in our hot food section or the fruit platter in our cold food section. Either way, there is a wide variety of choice when it comes to catering for your corporate activities in Melbourne. Look no further for your corporate event ideas: we have everything you need for a successful corporate fun day out. We can have everything organised around you and made to fit your schedule, so you can be assured that you’re creating a worthwhile experience for all your team members. Create an event they will never forget and that’ll they’ll want to keep coming back to year after year. 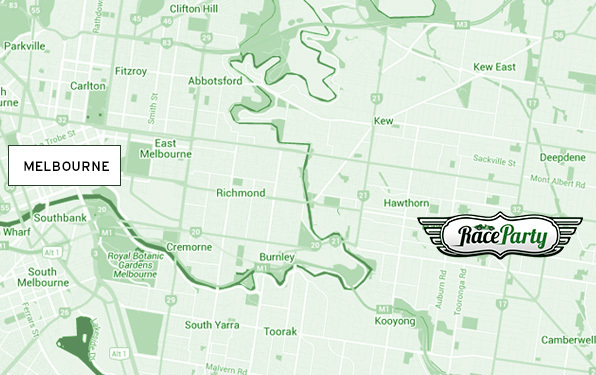 If you’re sick and tired of the usual run-of-the-mill corporate event ideas, Melbourne businesses are going to love trying something new and exciting at Race Party. There are no bridges to build, no rope ladders to cross and no danger of getting muddy or dirty. It’s the perfect corporate event for everyone, young or old, male or female and requires no prior experience and no physical stamina. Unless you’re already an expert in slot car racing, everyone has a good chance of ending up as the victor. What’s more, it encourages a healthy dose of competition along with the team building elements; after all, in business you need to be competitive to get ahead. If you’ve never organised a corporate event day before, you may think that they’re just an opportunity for your employees to let their hair down; but that couldn’t be further from the truth. Research has shown that successful team relationships are essential for maintaining an effective and efficient company. However, this may not come naturally in a working environment. By taking part in team building events, your staff will get to work and cooperate together in a social environment, building benefits such as increased morale, improved relationships, wider integration, more productivity and greater efficiency for starters. Most businesses also report that corporate event days result in better and happier working environments and more fluid communication that makes the business a better place to work. Unlike most corporate activities Melbourne wide, our corporate events in Melbourne enable your team to compete against each other for the ultimate victory – a place on the winners’ rostrum. But that doesn’t mean that teamwork will go out of the window as they will be encouraged to form alliances, spur each other on and enjoy the whole experience in an atmosphere of friendly rivalry. In fact, you’ll probably find it interesting to see who’s got the killer instinct, and who are the ones who seem quiet in the office but display a ruthless streak once they’re on the track. While the main focus of our corporate events in Melbourne is having lots of fun and getting a chance to bond outside of the office or work arena, if you do want to combine business and pleasure we offer fully equipped meeting and conference rooms onsite. So, if you plan to provide some lively entertainment as a welcome break from a brainstorming meeting, or you want to give your team a chance to let off steam before you present the new sales targets for the year, you’ll have the perfect space to combine both activities. And with full day, half day or lunchtime sessions available for our corporate events, Melbourne businesses will find it easier to fit a team-building event into a busy schedule.